The majority of people experience blemishes and acne breakouts on the regular and we've become obsessed with trying to get rid of them. In attempts to "dry out" the situation, we usually make everything far worse. Alcohol*, clearing gels, harsh toners, etc. elicit that stinging, tight feeling which only means trouble. Irritation on blemished skin causes deeper scars, too much oil production, and very red skin. Along with maintaining a daily cleansing and moisturizing routine, it is absolutely necessary to sleep 7-9 hours regularly (with clean skin! ), reduce stress, drink lots of water, and eat a diet rich in fresh food. Note: This is not called "how to cure acne"- I am no MD.! Those are only my initials. Possible acne cures include a change in lifestyle or diet, temporary antibiotics, or other prescribed drugs. These are simply tips to heal and prevent surface breakouts. Do not use face scrubs: most of these particles cause micro scratches and irritate breakouts even more, causing redness. Not to mention how they're entering waterways and harming the fish. (Read more on that here) Exfoliation is necessary, but a chemical exfoliant is better suited for blemished skin instead of a physical exfoliant. See more on that in part 3. 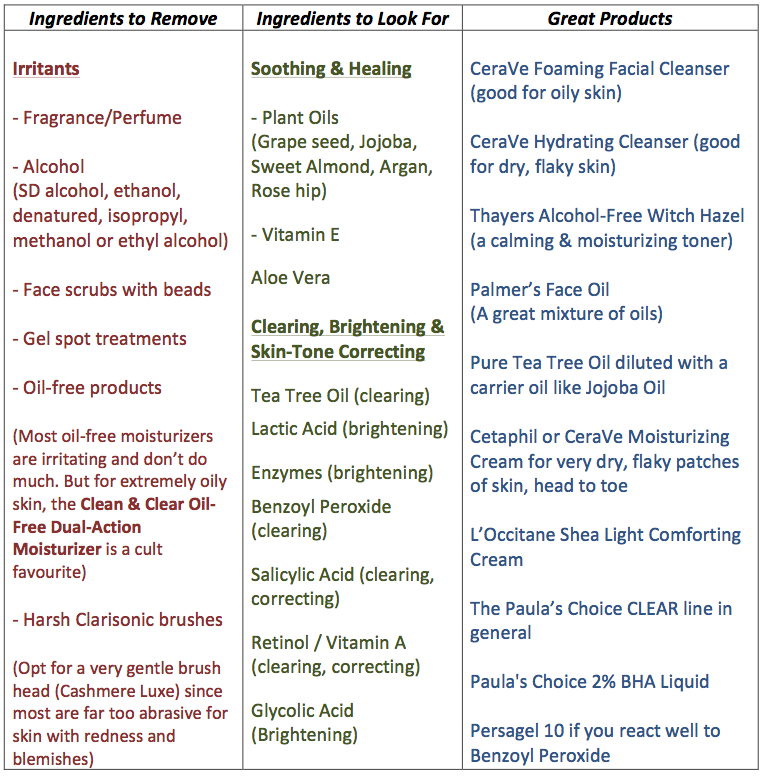 - Be wary of "clearing" or "oil free" cleansers and moisturizers. Sadly, most products marked towards oily acne-prone skin are way too harsh. If you are experiencing acne and redness, use products labelled "sensitive skin" and "fragrance-free" like most Cetaphil and CeraVe products. Note: Some people see great results with Clean & Clear Persagel 10 to dry out and kill the bacteria in a pimple - this benzoyl peroxide spot treatment can be too harsh for those with very sensitive skin. In general, only use these products in small amounts and don't expect immediate results! - Do you have a scab? Heal it! Don't continuously pick it off, unless you want a scar left behind. For a daily moisturizer, look for something with any of the following healing/calming ingredients. If you're going to be outside, wear one with SPF since the sun can make acne scars worse. Healing ingredients: Plant Oil (grapeseed, jojoba, sweet almond, argan, rosehip), Rosewater, Vitamin E, Aloe Vera, Green Tea, Gylcerin, Cucumber. - Less washing: Try cleansing your skin only once per day with an actual cleanser (at night) and use warm water and a cloth in the morning. Makeup remover cloths can also cause irritation, so use something like the L'Occitane Immortelle Oil Makeup Remover to dissolve all makeup and dirt before washing with a cleanser. I also love the Olay Daily Facial Cloths for a quick fix. - Don't use a million active ingredients: Use only salicylic acid, lactic acid, an enzyme exfoliant, benzoyl peroxide, or a retinoid. If you want to try a natural remedy, try Tea Tree oil in small doses - don't go sloshing a bottle of this super potent oil on your skin - hello, irritation. Dilute Tea Tree with a carrier oil like sweet almond and use it sparingly but regularly on congested areas. The LUSH Aqua Marina Cleanser (featured here) includes calamine and kaolin clay as the first two ingredients - it's super calming and effective. In order for your skincare and treatments to properly absorb into the skin and work effectively, you must gently remove the top layer of dead skin cells through exfoliation. Surprisingly enough, using something like an exfoliating Clarisonic brush could actually be a bad idea on inflamed, active breakouts. Either use a soft brush (Luxe Cashmere) or a baby face cloth to avoid the irritation that those plastic bristles may cause. Sebum (the oily stuff in pimples) is required to create a waterproof barrier on our skin and hair, protecting it from drying out. Sometimes, dead skin cells collect in the hair follicles (pores) and block sebum from being released onto our skin and hair. BAM. You have a whitehead or blackhead. Accutane (a form of Vitamin A) practically stops the production of sebum. This is one of the only treatments for severe cystic acne, since it can permanently heal the large pulsating cysts that form in the deepest layers of our skin. Topical products sadly cannot penetrate deep enough to heal those bumps. Now, before trying out this very strong drug, it is possible to control the release and production of sebum on our top layers of skin through proper exfoliation (chemically and physically) and sufficient moisturizing. As many of you know, the Paula's Choice 2% BHA liquid is my chemical exfoliant of choice (reviewed here) since it is a perfectly balanced salicylic acid treatment. I use it after cleansing, and before moisturizing, up to 2x daily. In addition to dissolving blackheads (this is an oil-soluble exfoliant), it reduces inflammation and can repair uneven skin tone and texture over time. Don't use this if you're allergic to aspirin, and make sure to wear SPF since chemical exfoliants make your skin more susceptible to sunburns. - Let me tell you one thing: OIL does not equal DIRT. Like I said before about the sebum, we need oil on our skin to protect it from drying out. When you cleanse your skin, the oil is removed. If you put alcohol on your skin, the oil is definitely removed. You don't need to disinfect your skin! After cleansing, use a moisturizer containing oil, or 2-5 drops of 100% plant oil. This will allow your skin to naturally repair itself in a balanced environment, preventing further damage. Plant oils (like the ones listed below) are nearly the same substance as our skin's natural oil. A few drops of oil used as a moisturizer will reduce redness and speed up the natural healing process for all blemishes. Keep this step for night time since oil doesn't tend to work well under makeup. See my full list of good oils to use on the skin, here. My skin right now is the best it has ever been and I can attribute that to reparative oils, minimal cleansing, gentle exfoliation using a soft Clarisonic brush/baby washcloth and chemical exfoliants daily. I also take an Omega 3 supplement daily which reduces dryness on my skin and eyes. 1. Consult a doctor or dermatologist to help regulate hormones, control bacteria production with (short-term) antibiotics, or highlight any underlying allergy that could cause a skin reaction. 2. Use a gentle cleanser for sensitive skin once per day followed up with Thayers Witch Hazel to balance the pH of your skin. 3. Treat with only one active ingredient that will brighten, reduce clogged pores and clear away dead skin cells to allow your products to reach their full potential. 4. Finally, MOISTURIZE! After every time you wash your skin. Keep that skin healthy and happy, beauties. Thanks for these tips -- they were very thorough. I threw out "scrubs" long ago because they would always irritate my sensitive skin. It's a tough battle dealing with acne, but it's important to follow tips like these.